A nanomask in our group is a self-assembled array of nanoparticles placed on top of another surface. This self-assembled array provides a high density pattern with the periodicity of the nanoparticles with typically 2-3 nm wide gaps between the particles. Fig. 2: A sample self-assembled monolayer formed from Fe3O4nanoparticles. These monolayers are the sources of our patterns. Our primary objective with this project is to take this ordered array's pattern and transfer into the underlying substrate. Our first step in this process is to use reactive ion etching (RIE) to pattern a silica (SiO2) substrate to demonstrate that it is actually possible to pattern a gap that is 2 nm across. Our next step is to transfer this dense pattern into a magnetic media, most likely for use with the C-AFM project. Fig. 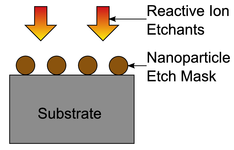 1: Schematic of using nanoparticles as etch masks for pattern transfer. (Left) The etchants (represented as arrows) react with the uncovered regions of the gray substrate, but do not react with the brown nanoparticles. (Right) After etching and removing the nanoparticles, the substrate has the same pattern as the nanoparticle array did. Fig. 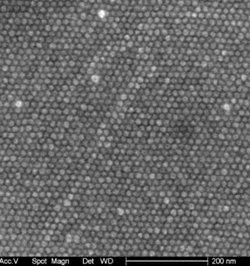 3: (left) A closeup image of the nanoparticles on top of the unpatterned surface.